I've never had much interest in photography. Until phones began to boast their megapixel count, I'd never owned a camera and had never been inside a branch of Snappy Snaps. These days, however, I've got an Instagram account full of pictures, some artier than others, where I've briefly considered subject matter and composition, whacked a filter on and uploaded it. Some of them get a few 'likes', but I'm no photographer. I don't really know what I'm doing. Technology has just levered some low-level desire within me to take pictures, facilitated it with simple tools, and bestowed upon me a warm, fuzzy feeling of creative fulfilment. Every time we go online we're bombarded with evidence of technology enabling us to make stuff. 500 hours of video uploaded to YouTube every minute. A hundred thousand posts on Tumblr, 60,000 Instagram photos, 12 hours of music on Soundcloud, 450,000 tweets, all in the space of 60 seconds. We're constantly urged to share our ideas, our creations, assured that they're worthy of attention and that other people will like them. 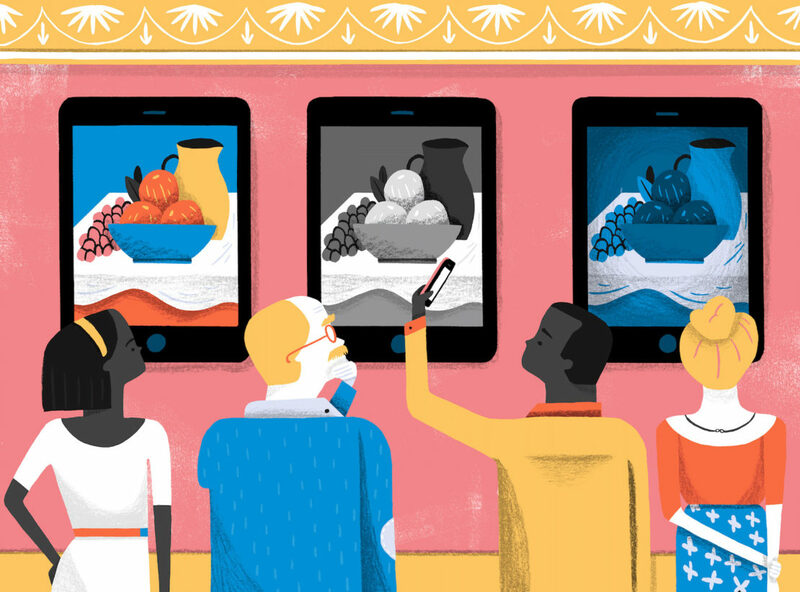 It seems like a technology-fuelled creative renaissance. And on first assessment, much of it looks and sounds good. The carefully designed tools at our disposal lend a sheen to everything we generate. Buttons and sliders make my Instagram snaps seem notionally attractive. YouTube automatically corrects the shakiness of my camera footage. When I make music, my guitar can easily be made to sound like something off a record by Slayer, Shalamar or Simon and Garfunkel, depending on my mood. Beats come prelooped and pre-approved. My singing sounds better than ever – but not because I'm any better at singing: the computer makes it so. The websites and blogs I created in 1999 look inept compared to the ones I create today, but my design skills are pretty much the same; technology just gives me a helping hand. By shouldering much of the creative burden, computer power makes us look and feel creative, and tech firms thrive on that. "Technology democratises a sense of being great," says Mark d'Inverno, professor of computer science at Goldsmiths, University of London. "It makes 'looking OK' seem much easier." But that in turn makes the idea of a creative renaissance seem a bit hollow. It produces lots of material – but is this the result of human creativity? Or just technological ingenuity we're happy to take the credit for? In her book The Creative Mind, Professor Maggie Boden describes creativity as the ability to come up with things that are "new, surprising and valuable". That might involve combining familiar ideas in unfamiliar ways, or exploring and transforming what she calls 'conceptual spaces', including "prose or poetry, styles of sculpture, painting or music, theories in chemistry or biology, fashions of couture… choreography… cuisine…" Of course some spaces, she adds, "have a richer potential than others". The conceptual space facilitated by technology is massive: the zeroes and ones that make up our digital world can be rearranged in an infinite number of ways. But technology has to artificially constrict that space for us, otherwise it would be too daunting. We wouldn't know what the hell to do with it. For tech companies trying to sell us a creative dream, processes have to be simplified to make hardware and software attractive to us, gently guiding us to creative glory with templates, presets, palettes of easily made choices. The results of this restriction can be seen all around us. One-click photographic techniques such as tilt shift and lens flare have quickly become clichéd. Our choices of typeface, from Comic Sans to the ubiquitous 'hipster' font Brain Flower, aren't choices pondered for very long. Music software imposes default settings on its users: young composers using Sibelius often generate work at 100 crotchets per minute, while dubsteppers using FL Studio (formerly FruityLoops) come in at a brisker 140bpm. Instagram's Clarendon filter is by far the most popular – and, perhaps unsurprisingly, it's the first option in the palette of choices. From vignetted wedding pictures to iMovie's well-worn video transitions, the consequences of technology's often-unintentional guidance shape our culture. In theory, creativity is supposed to flourish when our options are restricted. A study done by academics Anne-Laure Sellier and Darren W Dahl back in 2011 found that reducing the number of yarn options for a knitting project resulted in more innovative designs, and the link between scarcity of resources and creativity has been made time and time again by researchers. Last year, Ravi Mehta and Meng Zhu published a study in the Journal of Consumer Research on the link between abundance and creativity over a series of six experiments. "What we found," said Mehta, "is that abundant resources may have a negative effect on creativity. When you have fewer resources, you use them more creatively." But the digital world is curious in this respect. Yes, technology encourages us to create by restricting the options available, but it tries desperately to guarantee pleasant results with minimum effort. We're discouraged from pushing our creative boundaries. As a result, the likelihood of producing something new, surprising or valuable is diminished. "Politically, it's great that everyone feels that they can take part in the creative process," says d'Inverno. "If people start to understand how, say, music is put together using simple tools, that has to be great in terms of distributing knowledge. The danger comes if we think that that's what it means to be creative. A lot of these technologies work in a way that gives us a quick reward, and we become addicted to the social status it gives us. But it also gives us the sense that life is easier than it is. To get good at anything requires effort." This isn't effort we're necessarily willing to expend. Before our tech-centric world delivered abundance to our door, the limited tools at our disposal required more ingenuity from us: in decades past my dad would spend hours making pictures using nails and string, while I laboured with knackered tape recorders and guitars trying to make music. Was it a better time? No. Were the results any better, qualitatively, than the things we produce today? Probably not. Was more creativity involved? Well, it was harder work, if that's an accurate measure of creative zeal. Did we derive more satisfaction from those creative processes? Almost certainly – and, as Boden reminds us, creativity is a process, not a product: we might only be able to describe it in terms of the results, but it's the mental process we need to understand. Technology, and particularly the internet, has added levels of complexity to those mental processes. Reminders of opportunities to create are almost constant. Consumption of content limits the time we have to devote to creating it. Artists, meanwhile, can find themselves struggling with uncertainty and paralysis of choice. Made You Look, a documentary released last year, studies the way that British graphic artists have found themselves returning to analogue means in order to stimulate creativity. "I would be more than happy if the internet blew up right now," says illustrator Adrian Johnson towards the end of the film. "If I start looking at design blogs, it takes me into this tunnel of despair where I start to feel this self-doubt…"
In a talk given at the Smashing Conference in Barcelona in 2015, designer Espen Brunborg laid out additional reasons why he believes that connectivity hinders creativity. "We're simply too good at telling each other what to do and what not to do," he said. "The more guides there are, and the more we repeat them, the more they start to sound like commandments." Brunborg believes that in the quest to do things 'properly' – often by analysing endless metrics that determine notional 'success' – meaningful ideas get forgotten and creativity is stifled. As Edward de Bono said: "We need creativity in order to break free from the temporary structures that have been set up by a particular sequence of experience." Technology certainly sets up those sequences; we blindly follow them. The crucial question, of course, is whether this matters. If the creative splurge facilitated by technology makes us feel better, if it gives us a sense of developing ourselves as social, creative human beings, then what's so bad about that? One unwanted side effect, according to Brunborg, is a kind of cultural homogeneity. Colleagues of his in the field of web design have stated that "designers have stopped dreaming", that "frameworks and templates have us covered", that "web design is dead". Studies of popular music have identified a similar homogenisation, with smaller palettes of timbres and a decreasing diversity of chords and melodies. While the latter could be partly attributed to unadventurousness on the part of the music industry, with analytics again determining what 'works' and what is most likely to sell, technology certainly encourages the recall and duplication of the established building blocks of hit records, stifling experimentation. Then there's the concern that technology will take on even greater creative responsibility as time ticks by. It's certainly becoming more capable: software can draw, compose, generate jokes that aren't terrible, design websites. "The Grid, a piece of software, analyses your content and makes a website out of it," says Brunborg. "No designer needed… the very tools we've built to make our jobs easier are turning on us." But how much delight do we derive from consuming computer-generated content, beyond our amazement that the computer has managed to do it? "Art is experience," says d'Inverno. "It requires living, it requires being a critical, sensitive, emotional human being, interacting with [people in] the world and reflecting on who they are and what they do. That's something that technology can never replace. The reason art works is that it enables us to distil and intensify the nature of being; we respond to that when we see works created by other people's experiences." David Gauntlett, professor of creativity and design at the University of Westminster, doesn't believe that technological tools deserve too much criticism. "Not everything [created with assistance from technology] has a superficial gloss," he says. "Slick production tools encourage more experimentation; the baseline of what you can easily achieve has been raised, and I think this challenges 'proper' artists to do better. If what they make is no better than what somebody can bash out with some templates, they're not doing very well." This view is echoed by artist Hattie Stewart in the film Made You Look. "I think when more people are able to do creative things it challenges other people to think in different ways," she says, "to think of things that haven't been done yet. It's a fast-paced culture that enables quick thinking." The question, however, is whether technology takes the edge off that quick thinking, and whether the natural process of creativity, inherent in every one of us, is being blunted rather than nurtured by digital convenience. In 2010 Kyung Hee Kim, a researcher in Williamsburg, Virginia, studied 300,000 creativity tests going back to the 1970s and found that creativity among Americans had been declining in recent years. She found that many of us take a creative hit in adulthood when we become more aware of the notions of right and wrong answers but, more worryingly, children are also becoming less humorous, less imaginative and less able to elaborate on ideas. She laid the blame partly at the door of standardised testing, but also on passive activities that require no interaction. "The main worry," says d'Inverno, "is if we spend our time collaborating with technologies and losing the joy of making things with each other. In the west, we've glorified the idea of the lone, heroic artist, but these things are social processes." The idea of clicking a big red button marked 'GENERATE' to notionally create something can often be tempting. But we can make these tools work for us if we're prepared to work too. We can mess with them, create the new, the surprising, the valuable, by sneering at the suggestions they make and thinking, "No, I could do better than that." Because we can.